This morning my daughter insisted on wearing her rain boots to daycare, even though it was sunny with a predicted high of 90 degrees. I think they are a nice compliment to the tank top and bubble shorts. What do you think? I’m sure her feet will smell very nice when she gets home this afternoon. What a cutie! I love this outfit and her natural highlights. My mother insisted on letting me where WHATEVER I wanted. She wanted me to find myself and not be who she wanted me to be. As I got older and would look at pics I would say, “What were you thinking mom!?!?! I look crazy.” Then she would state the above. Love this post! It allowed me to revisit old fond memories. Thanks! Great, I’m glad you enjoyed! It’s fun to let kids express themselves through their clothes. You never know what they’re going to come up with next. It sounds like you have the sense to save your energy for more important issues. Good for you. 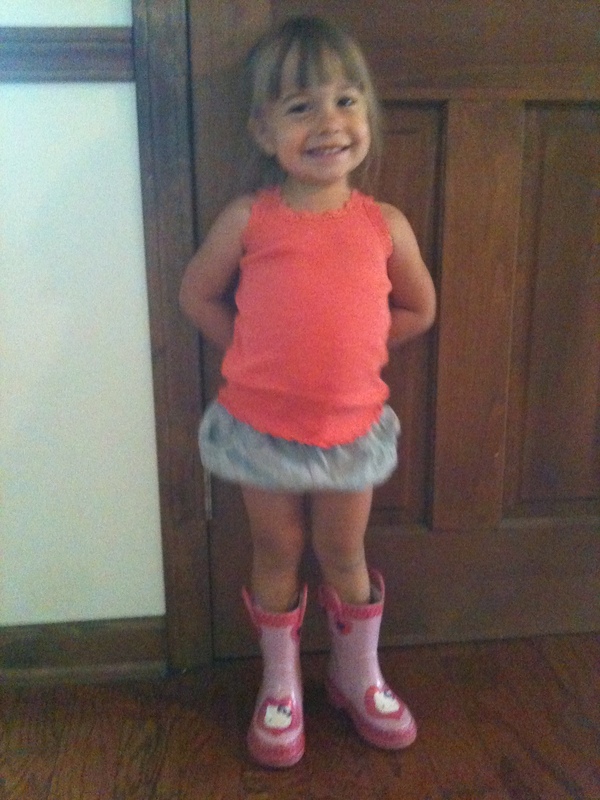 Oh, and that fashion statement with the boots… My 6-year-old did the same thing 2 weeks ago.Those feet will be ripe. Yup, I’m learning that as long as she can’t get hurt doing it, to just let her do her thing. Oh yes, those feet were stinky! Kids are so lucky- they dress crazy and people think they’re adorable. I go out in public like that and they’ll have me admitted, lol!